Observation - Poplar Hawk-moth - UK and Ireland. Description: Large (cf. my fingers behind) greenish caterpillar feeding on a hybrid poplar. Large (cf. 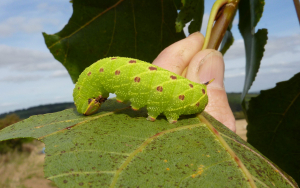 my fingers behind) greenish caterpillar feeding on a hybrid poplar.